Empathy is an important social skill. 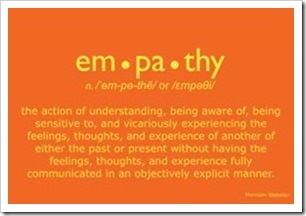 Some people are more empathic than others and the language a person uses reveals a lot about their level of empathy. In The Science of Empathy, I gave an introduction to the topic of empathy. In this post, I would like to share some common emphatic and non emphatic statements that kids and grown up may use. If you want to find out if you are more empathic than non empathic, use this post to measure yourself. If you use the statement often, give it 2 points. If you use it sometimes, give it 1 point. If you do not use it at all, give it 0. At the end, add up all the emphatic statements and all the non emphatic statements. Whichever has a higher number of points will show you what kind of sentences you are using most often. Here are some statements for you. I will give an example of empathy, and an example of non empathy for comparison. Feeling sad, hurt or upset when watching others who are sad, hurt or upset is the ultimate display of empathy. Kids are more sensitive to the pain of those who are close to them, e.g. family, friends and even teachers. Parents are usually their most important models of empathy. Being happy for others is a sign of empathy. Jealousy is usually the opposite. Being happy in others’ happiness is a sign of abundance in self-confidence, while jealousy comes from a position of lack. He/she can go play with her friends if she wants (non empathy). Generally, the expression “feeling sorry for” is a sign of empathy. To feel sorry for someone requires putting yourself in their shoes. Examples include, being sorry for other kids abilities (or disabilities), possessions (or lack thereof), living conditions, social status, opportunities, etc. It was such a stupid thing to do/say or why on earth would he do/say that? (non empathy). The ability to understand that different people have different points of view is a very healthy ability. An inability to do that can bring judgment and attract conflict. Trying to be considerate, regardless whether it is successful or not, is a sign that you considered another person’s feelings. Those who say what they want without considering others feelings usually get into more conflicts and have more relationships troubles. Consideration toward others is evident by: coming on time to a meeting, respecting others’ possessions, feelings or relationships. Less empathic kids are more opinionated, blunt, judgmental and inflexible. They have a black or white mindset and they prefer to do things “by the book”. The ability to predict what others will say or do is an intuitive function that is based on many subtle cues we are not aware of. A kid who cannot tell when it is a good time to show their parents their failed exam or ask for permission for something they want is usually because their parents were not consistent in their response. If your kids know what you are going to do or say in most cases, it is a sign that you did a good job. If not, consider your reactions. They are probably too random and chaotic. Kids can should be able to predict what the end of the movie/story/book will be, what people want to talk about and what they will feel/think/need. Kids and grownups who like making fun of others usually have less empathy. While humor can be important for social interaction, there is a clear distinction between cruelty and fun. A good way to distinguish between the two is to check which party thinks it is funny. If both sides thought it was funny, then it is humor. If only one of them thinks it is funny, that is cruelty. Rejecting cruelty is a sign of empathy. However, you might be surprised to know that preferring animals to humans is a sign of difficulty in “reading” other people. It indicates challenges in empathy. Do not get me wrong. 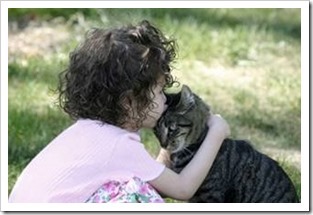 A love of animals can be a wonderful thing. But some adults express such an extreme love of their pet, to that point that they risk their kids thinking they prefer their animals to their own kids. Empathic kids are more flexible because they understand that others may be different to them. They will make more of an effort to explain themselves while non empathic kids can be very opinionated. Non empathic kids are more focused on the topic at hand but they listen less , which makes it harder for them to understand why others do not think and do things the same way as them. This mindset sometimes gets them into big relationship troubles. Caring is a sign of empathy. Doing things for others, helping/supporting, volunteering time/ skills/money is a sign of a high level of empathy. Kids who do not care are usually busy with their own feelings and emotions. It is usually a sign they do not have “enough” of their own self confidence to give anything to others. 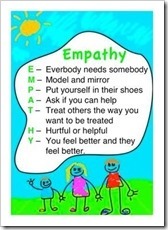 Empathy goes hand in hand with social skills and a lack of it goes hand in hand anti social skills. Empathic kids value friendship and find social situations comfortable. Non empathic kids find social interactions very confusing and hard to explain. When a child does not benefit emotionally from a social situation, feels overwhelmed, or cannot predict how others will behave, social interactions become a burden. By helping them feel and display empathy, you change their social lives forever. They way to do this, is through modeling!